I usually try to stay out of pickles. But summer brings on an annual predicament of too many of this and too many of that. Cucumbers, peppers, onions and cabbage are ripe and ready to eat, but who can possibly consume a garden all at once? Not wanting food to go to waste, grandmas and gardeners devised a brilliant brining process to get themselves out of that pickle! 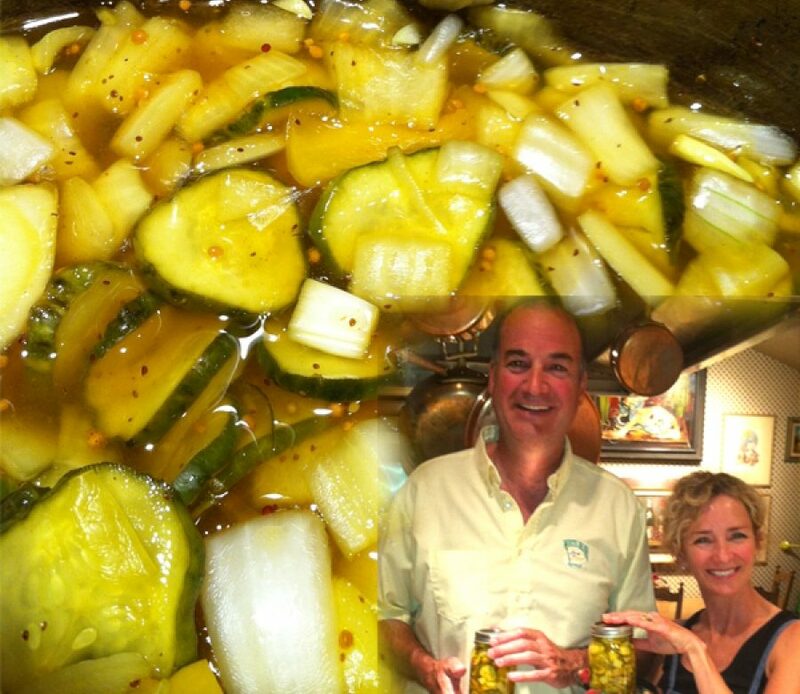 In fact civilizations may have survived because of the pickling process. Before the invention of the refrigerator, preservation was the name of the game so conservation by brining, smoking, spicing or drying was widely used to make food available during the sparse winter months. The earliest evidence of pickling, anthropologists have discovered, goes back more than 4,000 years to India and ancient Mesopotamia. Julius Caesar fed pickles to his army thinking that it would give them spiritual and physical strength, and Cleopatra claimed that pickles were the reason for her exceptional beauty (and perhaps her well preserved youth). My mom used to make delicious pickles and my brother Kurt and I decided we missed that yummy treat, so with his inspiration we tried to replicate her memorable bread and butters and dills. What great fun we had with our aromatic vats and boiled jars everywhere. I have never chopped so much in my life. But the end result was a delicious delight we enjoyed the whole year through. What about the nutrition aspect of brined foods? Yes, there is a high degree of salt in pickling, there’s also vinegar (acid), spices, herbs and sometimes sugar too. These ingredients play a role in denaturing or cooking the plant cells as well as anti-microbial functions, keeping bacteria at bay. But this process adds a lot of pungent flavor. In some cases pickling can increase the nutritive value of foods, encouraging the production of active healthy microorganisms in the fermentation process. The best rule of thumb is to include pickled foods in your diet as a condiment, just don’t overdo it because too much salt in our diet is always discouraged. Pickling is becoming en vogue again and we see our chefs adding a touch of preserve and savory tang to their summer festival dishes. Check out the delicious way Salty’s is sousing blueberries, and our rabble-rouser Chef Jeremy is stirring up some delicious ideas that will help get you into a pickle, but I don’t think you’ll mind: Pickle Your Fruit Not Your Liver.